Sleek and Stylish. 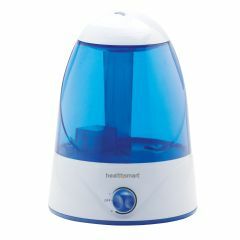 This vibrant blue and white humidifier will add a sophisticated touch to any decor. Relief for dry skin, throat irritation, coughs and congestion. Control the humidity in the air by adding moisture to the air on dry days, keeping your skin moisturized, helping you breathe easier and reducing static electricity. Don't let dry skin slow you down. You won't have to constantly interrupt your day or night to refill it because it runs up to 50 hours! It has a large 1.32 gallon capacity. The low water indicator lets you know when it's time to refill and Cosmo Mist shuts itself off when it runs out of water, leaving you with more free time. Refilling is a breeze with the convenient water tank carrying handle. Cool, quiet mist. Safe ultrasonic cool mist technology means you do not have to monitor who touches it. Control the amount of mist with the 360 degree rotating mist nozzle and adjustable mist knob. It's whisper quiet and will not disturb or distract you while you sleep or work. Filter free. You won't have to purchase costly filters or wicks or spend time replacing them. The sleek, contemporary frame is 9 inch diameter (bottom) x 6 inch diameter (top) x 13 inches high, so it fits nicely into any space.